Three. Two. One. Blastoff!! For most of us, navigating a spaceship through outer space is never going to happen. Most of us don’t have the drive, intellect, and stomach (to not throw up). But shooter video games like Song Zuofei’s Space Raider for the iPhone and iPod Touch offers the opportunity to fly our own little spaceships while we work the daily grind. The game features cute cartoon drawings like you’ll remember from your good ol’ kindergarten days. Instructions are easy to follow and available before every level. It’s nice that the developer provides the mini-instructions and doesn’t assume users know how to play immediately. So how to play? You’ll slide your finger to control the spaceship, launch different weapons, and avoid enemies that come from above. In order to complete a level, you need to collect certain amounts of power boxes to finish a level. For the first few levels there are no weapons available to you, and your only goal is to avoid enemies. The levels get harder as you play with more enemies and obstacles. As you advance to the 4th level, you will have available to you: missiles, lasers, and super bombs. You can use these weapons on your different enemies when collect enough missiles, position yourself directly below enemy, and launch with the button on the lower left-hand corner of the screen At that last level you have the final boss to look forward to defeating. This cute little app has definite replay potential and becomes very addictive. Graphics, music, and artwork in this game are great. The folded effect of the background with moving stars was a nice touch. Sound effects were spot-on when the user loses lives, crashes into enemies, launches missiles, and gains power-ups. The controls were responsive to my touch so I didn’t have to fight to make the spaceship move unlike some other poorly made shooter games. I also appreciated the fact that my finger didn’t have to be directly over the top of the ship just to control it. Now for some suggestions: it might be nice if the developer reiterated how to launch rockets at enemies after the 4th level instead of having users go back and see for themselves. But that’s a minor quibble. The one thing that really annoyed me was that the pause button at the upper right-hand corner was not a true pause button–when I pressed it, it would just redirect me to the start page and I wouldn’t be able to resume my game. The developer could also add a couple more levels, enemies, power-ups, backgrounds and weapons. The ability to submit personal high scores to online local and global leaderboards, recommend the game to a friend, and challenge others via social networking tools (i.e. OpenFeint), might get more users to try out the game (and make the developer some more moolah). Overall, I would recommend this game. For what it is, it does a good job. It’s a fun little app when you’re waiting in line, stuck in elevator ride, or just have some time to fill. You’ll also be able to entertain your little cousins, nephews, or friend’s kids if you’re ever stuck babysitting. Users who don’t want to commit to buying the full version can download Space Raider Lite at the iTunes store for free. The difference between the full and lite version is that the lite version only offers the first 4 levels and 1 missile weapon. 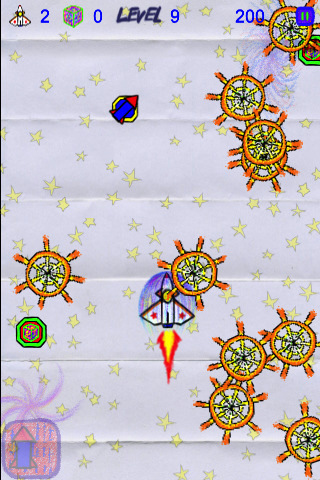 But for $0.99, Space Raider a great little pick-up-and play app for young/old astronaut dreamers and non-dreamers alike. AppSafari review of Space Raider was written by Linda Ta on March 18th, 2010 and categorized under Action, App Store, Fun, Games. Page viewed 3219 times, 2 so far today. Need help on using these apps? Please read the Help Page.